and you smell just like marshmallows. and your mash potato is always lumpy. when you have lots and lots to do. ...today we'll let you rest. (we'll go and bug Daddy instead) ..
Will all have gone away. 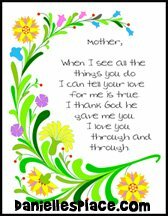 Mothers Day Poems from Kids? Nor heeded the glance of her anxious eye. "I'll help you across if you wish to go."